Traditional Swiss recipe for relaxing anytime and a restful sleep at night. 100% certified organic herbs of: Passionflower, St John’s Wort, Lemon Balm, Licorice root, Chamomile, Lavender. Enjoy 1-3 cups daily as a relaxing health drink. To support full nerve restoring benefit take 3 cups daily for 6-12 weeks. 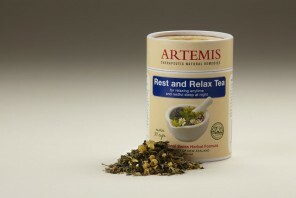 Take as an evening drink for winding down or drink a cup 1/2 to 1 hour before bedtime for a restful sleep. Can be safely taken longer for maintenance. Take 1 level teaspoon (1g) per cup (150ml), place into infuser, plunger or china pot, pour over boiling water and leave to infuse for 5-10 minutes. Do not microwave. Use as directed. If you are on prescription medicines (re: St. John’s Wort) or if symptoms persist see your health professional.